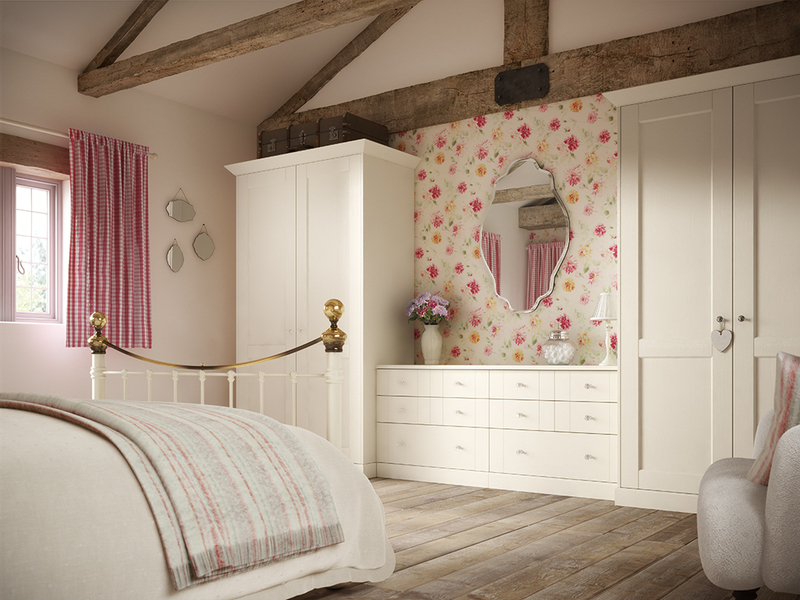 Make the most of the space in your bedroom with fitted bedroom furniture from Panararmer. Enjoy the luxury of bedroom storage designed for your needs – all your suits, gowns, handbags, shoes, accessories and shirts in their own custom-designed spaces. 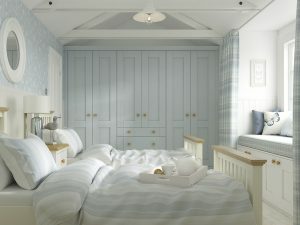 Sleep peacefully in a bedroom designed and fitted especially for you. Choose from the luxury Symphony Laura Ashley or Urbano range of bedroom furniture and fitted wardrobes at Panararmer. Talk to our expert designers and let them help you create the bedroom you can dream in. A tranquil escape from the stresses and strains of work and family life, or a bright practical room where your teenager can study, pursue their hobbies and occasionally be motivated to tidy up! You’ll be amazed and delighted how even a small bedroom can be transformed with some imaginatively designed storage and high quality fitted bedroom furniture. We’re bedroom fitting specialists who have had many years of experience in interpreting and creating the ideal bedrooms for a variety of different clients who have had very different styles in mind. From tranquil escapes to bold, bright spaces, no matter what kind of colour palette you’re looking for, we’ll be able to create a design around it. Space is often something that people wish they have more of, especially in the bedroom. However, it’s not as difficult as you may initially think; in fact, it’s quite easy to create space with very little effort. Using various storage options such as built in, sliding door wardrobes, it can be incredible just how much space you can free up in your bedroom, making it easier to keep your bedroom space clean and clutter free! Your bedroom is meant to be a personal space, and that’s what we excel at creating here at Panararmer. We take a look at what your likes and dislikes are, and come up with the most closely related vision imaginable. This way, you’ll have an ultimately unique space just for you to enjoy. At Panararmer, you’ll find all the services you need to transform your bedroom. Our in-house team of skilled craftsmen and trades people will ensure that every last detail is perfectly installed – from subtle lighting to smoothly gliding drawers and wardrobe doors. Drop into our showroom or give us a call on 015395 63523.